Memorial Sloan-Kettering Cancer Center cell engineering researchers and their clinician colleagues have been in the news recently for a successful experimental cell therapy. Called targeted immunotherapy, a patient's T cells are genetically altered in the lab, then reintroduced with the directive to target and kill cancer cells. The treatment was carried out on a group of adults who all suffered from a rapidly progressing form of leukemia that had not responded to chemotherapy. All five went into remission after the novel cell treatment, and three have stayed that way for a number of months. Results of the ongoing clinical trial appeared in the March 20 online edition of the journal Science Translational Medicine, along with an article in the New York Times. B cell acute lymphoblastic leukemia (ALL) is particularly deadly in adults, with a cure rate of only 40% from the traditional treatment combo of chemotherapy and a subsequent bone marrow stem cell transplant. When chemotherapy fails to cause remission, the ALL patient is not able to progress to the stem cell therapy and the end usually comes quickly. 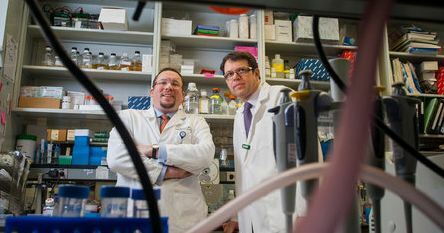 In the immunotherapy procedure pioneered at Memorial Sloan-Kettering, a patient's white blood cells are removed and a new gene is introduced into the cell using an engineered viral vector. When returned to the leukemia patient's body, the altered cells recognize a protein called CD19, which is present in B cell ALL tumor cells. The immune system attack is then full-blown, and patients needed to be treated for extreme weakness with steroids during the battle period, but the result was remission within a matter of days. The three treated individuals who remained in remission (one relapsed, and one died of an unrelated blood clot) went on to have bone marrow transplants, not because they necessarily needed it (there was no cancer in their blood at that point), but because it is standard procedure. In another recent blog of ours, we highlighted 4 Manhattan researchers (two from Rockefeller, one from Memorial Sloan-Kettering, and one from Weill Cornell) who each won the newly-established $3M Life Sciences Breakthrough Prize. Biotechnology Calendar, Inc. is a full service event marketing and planning company producing on-campus, life science research tradeshows nationwide for more than 20 years. We plan and promote each event to bring the best products and services to the best research campuses across the country. Twice annually we hold our popular Rockefeller BioResearch Product Faire™ events on the Rockefeller University Campus in New York City, with attendees coming from neighboring Weill Cornell and Memorial Sloan-Kettering as well. The upcoming spring event will be held next week on March 28, 2013, with the fall show taking place October 2, 2013. See our complete 2013 Show Schedule here.